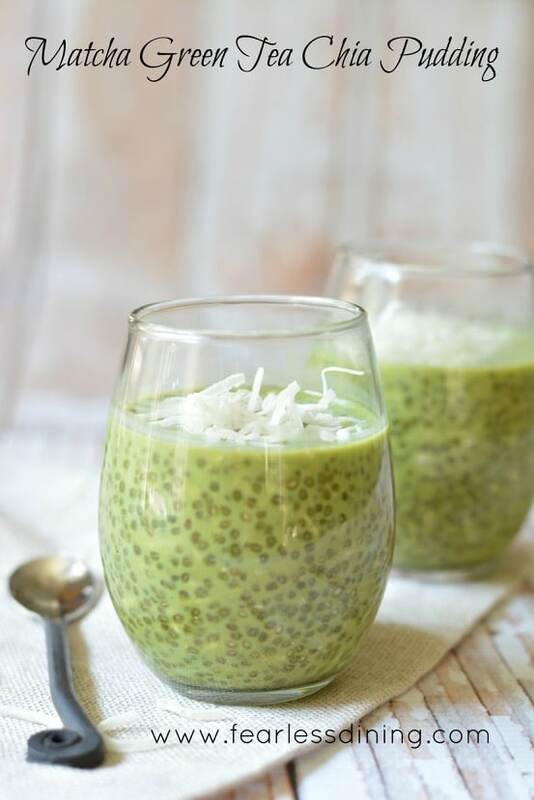 This Matcha green tea chia pudding with coconut makes a wonderful breakfast or snack. Just dump the ingredients into a container and put the container in your refrigerator overnight. Wake up to a creamy matcha chia pudding breakfast! Breakfast doesn’t get any easier than this! What is special about this matcha green tea chia pudding? Chia pudding is high in protein, making it a great breakfast option. The matcha green tea in this simple chia pudding recipe gives you a nice little caffeine boost! If you haven’t tried chia pudding, you are missing a wonderful healthy treat. Chia pudding makes a delicious healthy breakfast or a protein-packed snack! I was a little scared of chia pudding at first. It was almost comical…I am sure you can imagine my original thoughts along the lines of eeewww and slimy. This chia pudding recipe will change your mind about those tiny little chia seeds. 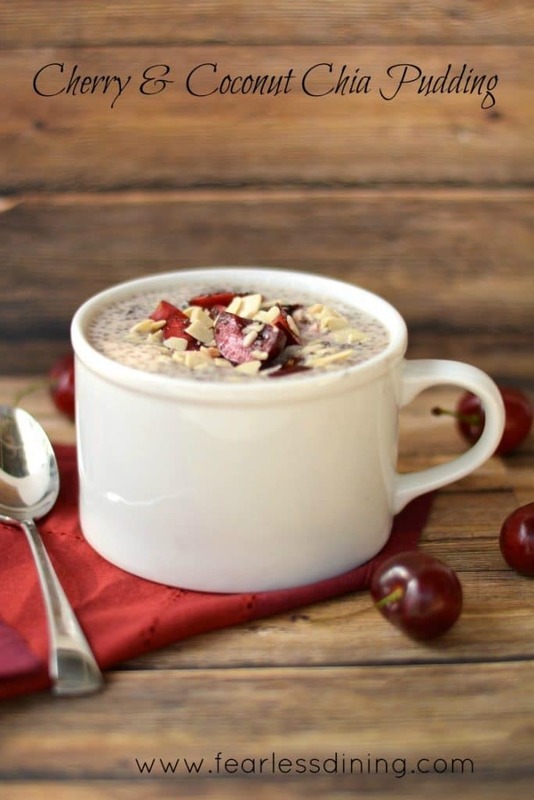 You can read about my hesitations and how I became a convert after trying a coconut chia pudding in my post, Cherry Coconut Chia Pudding. Mr. Fearless Dining loves this Vanilla Chia Pudding with Dates and Pecans. Is Matcha Green Tea Gluten Free? 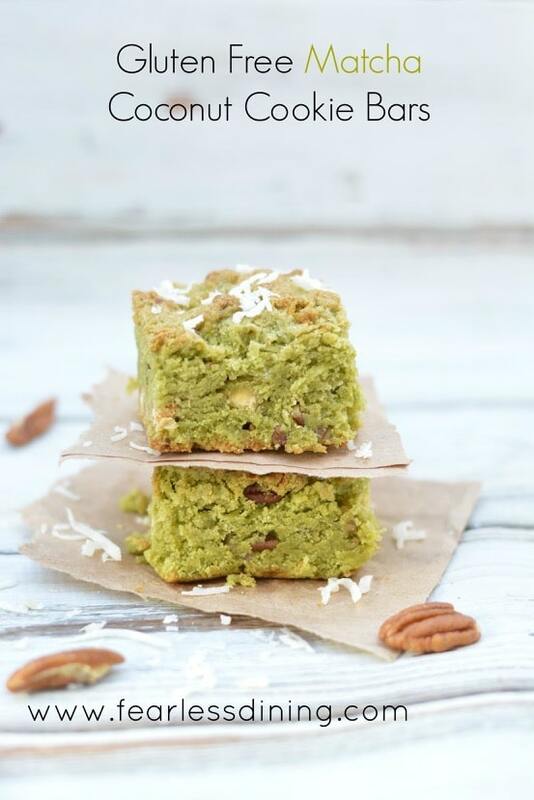 I have been experimenting more and more with matcha green tea powder in my cooking and baking recipes. Green tea is full of antioxidants, and it even has a small caffeine boost :-). If you prefer to make your own sweetened matcha, it is very easy to make. 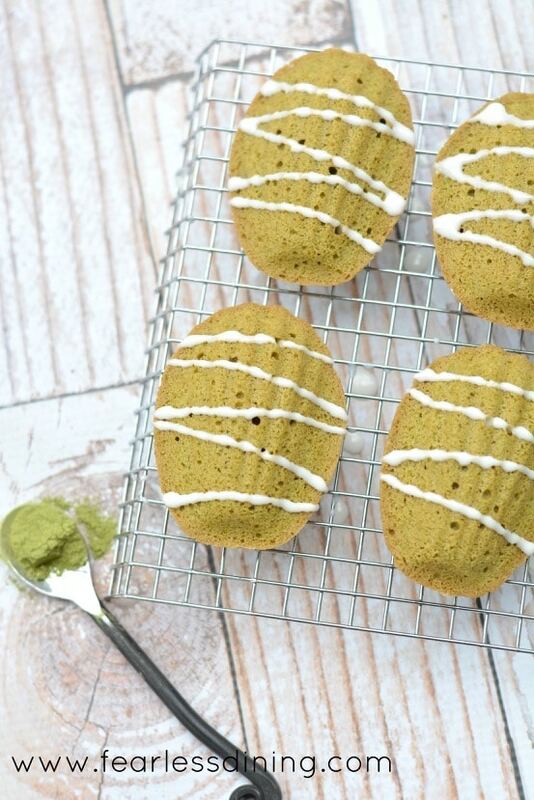 Just take unsweetened matcha powder and add an extra teaspoon of sugar or a packet of stevia to your baking. You will love it in this matcha chia pudding! If you haven’t tried chia seeds, there is nothing like a first time. Chia seeds are full of protein, healthy omega-3 fatty acids, fiber, antioxidants, and minerals. Chia makes an excellent egg replacement in recipes. Just mix 1 tablespoon of chia seeds with 3 tablespoons of water. Let it sit for 10 minutes and you have a delicious chia egg! I love to add chia seeds to my baking. This delicious Gluten Free Oatmeal Bars recipe is a great way to introduce chia seeds to your diet. Click here to see all of the pudding recipes on this blog. Glass Container with Sealed Lids: I use these containers all of the time. They are perfect to make chia pudding and overnight oats because they seal up air tight. Chia seeds: I prefer organic, but I am that organic freak type of person. 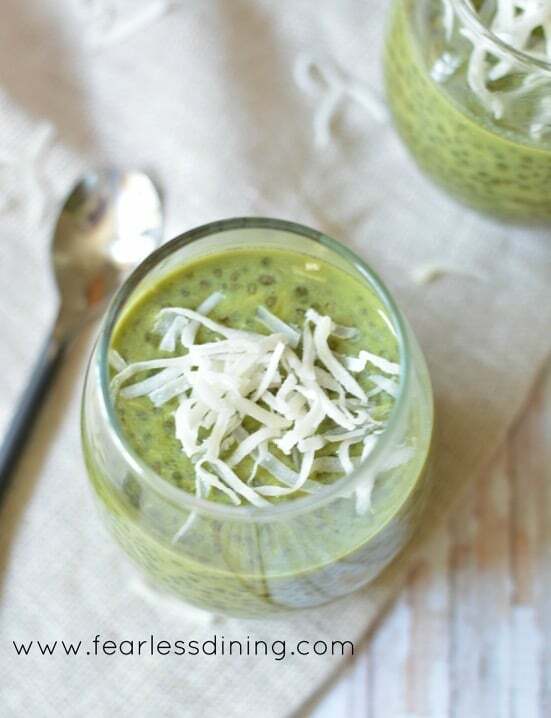 Easy gluten free matcha green tea coconut chia pudding. In a large glass container, add all ingredients. Put on lid, shake well, and store in refrigerator overnight. Stir after the first hour, or before you go to bed. This recipe is also delicious when you garnish it with sliced almonds and more coconut. Looking for more matcha recipes? 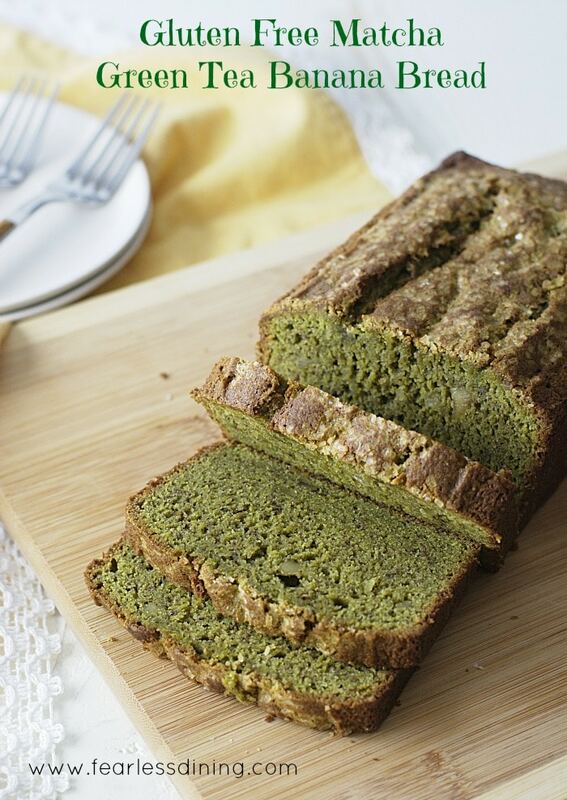 Give this gluten free matcha banana bread a try. 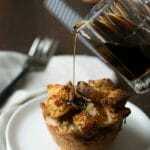 More Breakfast Ideas to Tempt Your Tummy! I am a fan of chia seeds, I try to add it almost all my food items, I love the idea that you have added it to in the pudding, can I replace sugar with black jaggery, will it effect the taste… I plan to try the recipe this weekend please do let me know..
Do you use canned coconut milk or the carton beverage coconut milk in your recipe? We love chia seeds too, they are a great way to sneak in extra nutrition! Such a pretty pudding! My husband has been so obsessed with chia pudding, I think I will make this and surprise him! Thanks for a great recipe! Love this idea! I’ve turned into a huge matcha fan! We love matcha too…plus it gives a little caffeine boost! I love matcha green tea! This pudding looks wonderful! very unique and creative recipe I love the tea so I am sure this is fabulous too! I must try this! This is totally my kind of recipe and I’d love to have it for breakfast….almost everyday 🙂 I love Match n Chia, so this is a favorite combination. I feel like I waited forever to try chia…now I am addicted! So pretty, green and delicious looking pudding. Love chia and can never have enough matcha. Yumm! Thanks for sharing. Great idea! Double the superfood power! I’ve never made anything with chia.seeds in it. We buy bread with it in and it is quite delicious so I really should give it a go!!!! I have not tried matcha yet but this recipes looks like a great start . You mention your Matcha is sweetened, but the one I have isn’t. Would adding agave affect the consistency? Would adding an extra teaspoon of chia seeds balance the excess moisture? I have not tried agave to sweeten. In theory, it should be fine. If you try it, can you please come back and report how it goes for others? Thank you so much. I just tried this pudding, because it was SO pretty. I found that there was way too much matcha, like the previous commenter thought. I also used unsweetened coconut (which I already had in my pantry) and added some honey to sweeten it, as the pudding was very bitter. I am sorry it was too strong for you. I find that people either like it strong like me, or in a much more mild version. I will make a note in the ingredients so people can gradually add to their taste. Thank you so much for stopping by and letting me know. Hi. Do I made this recipe because I LOVE matcha and I loved the color! Are you sure you used 2 TABLESPOONS matcha green tea??? It was WAT too strong. I ended up adding a while can of coconut milk and more chia and it still needed more milk! My green tea powder came with a scoop, about. 1 teaspoon. Of I were to guess, 2 tsp. 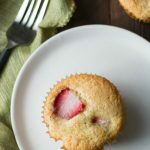 Match a is a more approoriate amount with this recipe. I also added 1 tsp. Vanilla and some nutmeg and a little raw honey… OMG, this is my new favorite caffeinated treat! Thanks for sharing! This looks amazing, never tried anything like it!! Such a pretty color too! I definitely have to try this! I have never had matcha green tea! It looks very pretty! I love Matcha and love Chia so this pudding is something I want to try ’cause I know I will love it! Great flavor combination. This will definitely make me like Chia seeds. Chia pudding is awesome and your version looks wonderful! I actually have everything in my cupboard to make this – which would be great for the supper party we are hosting tonight. I’ve never tried chia pudding yet, but I’m intrigued by it! I should expect this version would be quite the energizer! I must admit I am somewhat wary of Matcha tea and Chia pudding. I am encouraged to try this recipe though. Your gorgeous pictures make it look delicious!! It does look odd, but the flavor is pretty delicious. I have never had chia pudding or matcha and now I want to make this to try both. Looks delicious. I haven’t yet tried matcha, I’m sure it’s delicious and I know it’s on the healthy side of the scale. I love the way the chia seeds look in the glass. I haven’t come across matcha powder yet, but I’ll keep an eye out. My mother in law talked her Starbucks into selling her a few bags…it was pretty funny. I found mine on Amazon! i was just wondering how long this keeps in the refrigerator? And how much does this recipe make? I plan on making it tonight! Thank you for posting this! Hi Christine, because it is non-dairy this should keep for 3-4 days in the refrigerator. The chia seeds do expand, I would say the end result was about 2 cups of pudding. (I made it in a glass container and didn’t measure the end result, so this is my best guess.) I hope this helps. Thank you Shobha…they are pretty interesting in how they work. Many who are egg free use these soaked in water as an egg substitute. I love chia seeds. I have made mango chia pudding. Never tried matcha tea one. Would love to. Love the lovely green colour. Sandi, I am taking a liking to chia seeds too and love it with coconut milk! I have to try the matcha green tea- sounds delicious! Great pictures! I love the colour. This looks yummy and healthy too. Thanks for sharing. I must say, I’m a little skeptical of chia seeds and edible green tea, but that looks absolutely delicious. I’m impressed that it has so few ingredients, too! It seems like something like that must be fairly healthy for you (especially given all I’ve heard about chia seeds). I don’t want to be a skeptic any longer–I plan to make this soon! Thanks for the recipe. I am so making this tonight! I have everything in the house to make it! Just brilliant. So excited to pin and share!!! Great little recipe. My daughter loves everything green tea, so we will definitely have to try this out! Your daughter has great taste Kim 🙂 Have a great week. I got to try chia pudding a couple weeks ago, and I LOVED it! Yours looks fabulous. Love the pretty color and the Green Tea! Awesome. Can’t wait to try it! Pinned! I’ve not tried Matcha, but this chia pudding sounds like a great place to start. I use chia seeds in so many recipes. Love the texture. I like matcha because it is a bit healthier than a cup of coffee 🙂 I have been having fun experimenting with it more and more in my baking. I love both chia pudding and matcha. This looks absolutely lovely! I’m ready to dig in – so nice! What a great healthful drink! What a lovely, healthy recipe – and it looks so beautiful too! Well, I haven’t tried either of them yet, I’m such a wimp when it comes to new textures. I am getting closer to trying though, seeing beautiful recipes like this gets me motivated! Keep them coming! I am a whimp as well Christine…it wasn’t until a trip to Austin when I tried it at Snap Kitchen did I realize it was good. Exquisite desert here and so beautifully shown. I can only imagine how wonderful this pudding must taste. This is so pretty! My husband loves matcha and chia seeds so this would be the perfect breakfast for him! Your pudding looks delicious 🙂 I don’t believe I’ve ever had matcha green tea before, I need to look into that! These just shout spring to me. I love the pale green from the matcha. Lovely. The ½ cup lightly sweetened coconut, is that shredded coconut or fresh coconut meat? 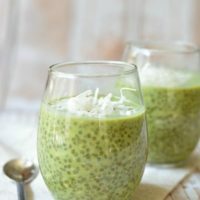 How do I get the recipe for Chia Green Tea Pudding?